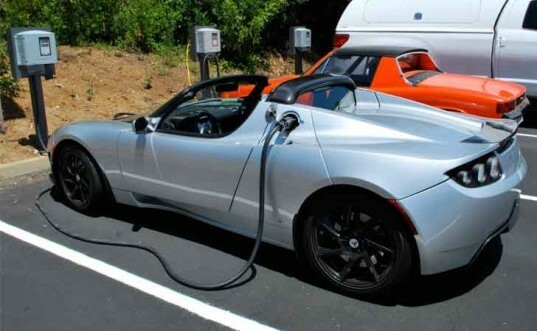 Inhabitat recently had the opportunity to take a Tesla Roadster electric sports car for a spin around Silicon Valley. How could we turn down a chance to have some zero emissions sports car fun? We headed to Palo Alto and accepted the keys for a day of green driving fun. The day was hot and the car was very, very fast. Electric cars have all of their power available to you at all times, so if you want to, say, take the car from 0-40 in two seconds, your lungs will simply wrap themselves around your spine and you’re off. Or say you wanted to take the car from 40-90. No problem. Done in another two seconds. Suffice it to say, this is a fun car to drive on the winding roads of the Los Altos Hills and Palo Alto. Caveat: Please note that driving a Tesla Roadster may result in involuntary hysterical laughter. But we’re getting ahead of ourselves. Before we even took the Tesla Roadster out for a drive (they gave us the optioned out car Tesla CEO Elon Musk drives when he’s in town), we were given a tour of the facilities. Tesla will soon be expanding operations to the former NUMMI plant in Fremont across the Bay, but for now, all powertrains are made at the Tesla headquarters before and after Lotus has their way with the car bodies. Tesla makes 9 powertrains per day in this facility. Each one includes 6831 battery cells, and each battery cell must be tested for quality. That’s and intensive job, but the work environment appeared pleasant enough. Tesla’s manufacturing floor is housed in an old HP facility, and the floors just could not be any whiter or shinier. The “factory” is as clean and quiet as the end product. So, then we were off to drive on the winding roads, and boy, did we have a good time. The Tesla is designed for pure driving fun. The HVAC system is an afterthought–just a few manual knobs circa 1985–but we assume that’s to save weight. Stereo: just fine. Navigation system? Well, a little slow and an unsophisticated interface by today’s standards, but all of these little weaknesses can easily be polished up by a baby company that is maturing by leaps and bounds. The steering wheel is small, and has a real manual feel of being connected to the road. Fortunately it’s not too tough to operate. The chassis clearly isn’t designed for too much rough stuff. It was thrown around a bit by some bumpy roads. 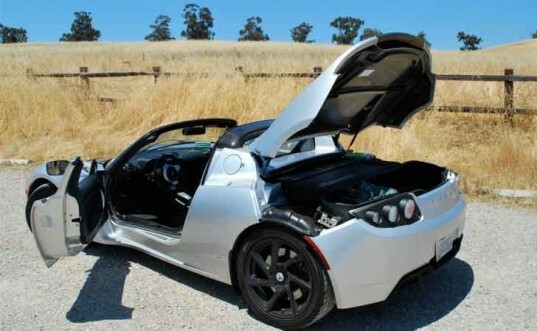 And underneath the lovely body, the chassis of the Tesla Roadster looks just like a go-kart with a huge battery pack filling the trunk. There’s room under the huge floppy trunk lid for the tiny fabric roof, a charging cable, and a purse. In contrast, the Model S sedan will carry its battery pack underneath the car in a 4-inch deep carrying case that runs the whole width and length of the car’s wheelbase. It also has a more traditional car chassis, so we will expect a very different ride from the sedan. Maybe a little less hilarity, too, though. I personally was disappointed with the performance and handling of the Tesla. When driving it I felt as if I were in a Honda Civic. It is a smaller car that has that "cheaper" feel to it. Not impressed. Fisker's Karma on the other hand is the next car for me! I'm an old fashion gear head and I approve of the Karma's power! Having driven the Roadster a couple times I can confirm it is a smile and laughter inducing experience. The 0-60 time of under 4 seconds is astonishing. Zero noise. Zero CO2. Zero liquid fuel. The biggest thrill was to drive past a great big Exxon station where cars jockeyed for position to refuel. Me and the bright red Tesla drove past silently - thinking, we'll never have to do that again. Tesla headquarters in Palo Alto has a row of EV chargers in the parking lot, for juicing up cars like this one: the car Tesla CEO Elon Musk drives when he is in town. We took the Tesla on winding roads to a nature preserve, where the car attracted just a tiny bit of attention. A closeup of the car reveals plenty of carbon fiber bits to reduce weight, both on the hood and in the interior of the car. The author Laura K. Cowan's family was on a business trip/vacation during this test drive, making her daughter one of the first two-year-olds to get a close look at a Roadster. Here she is admiring the Tesla visitor pass. The trunk lid of the Tesla Roadster is a bit floppy, but that's because it runs the full width of the car. See how even the top of the wheel well is incorporated into the trunk lid, a unique feature. Not a lot of room in there for your golf clubs, sorry. But the next-gen Model S sedan stores the batteries in a shallow case under the floor of the car, so this won't be an issue with all Teslas. The automatic transmission shifts by push button on the center console, and drivers get not one but two small digital displays to monitor all their gadgets. The thin racing bucket seats sit just 2-3 inches from the floor of the car. It really is like driving a carbon-fiber go-kart with a rocket engine. The push-button door handle on the left is nestled into a stylish groove built into the side of the car. We love the rocket-style taillights that stick out from the rear panel just a bit to hint that this is no ordinary convertible. Beautiful and simple wheels: check. Brakes that really bite: check. 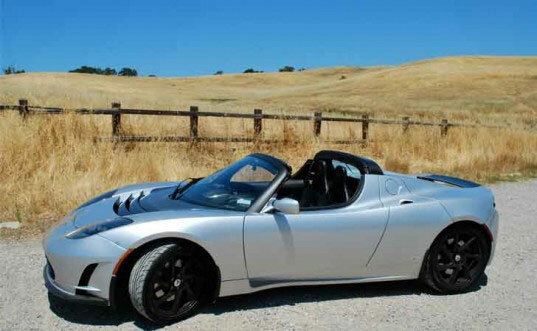 No one mistakes the Tesla Roadster for an ordinary roadster, though hints of Lotus styling do appear in the body, which was assembled by the company for Tesla. Is that a tiny bit of Ferrari in the back end? The styling of the back of the car is truly beautiful, with different details revealing themselves up close and at a distance.